← A very rich lady bares all! RVSue meets Bob Wells of cheaprvliving.com! After a day of stormy weather, the crew and I are in the mood to go somewhere. I lock up the Best Little Trailer and toss Bridget and Spike into the Perfect Tow Vehicle. I want to see what lies to the west of us. I turn onto Courthouse Road. Soon we’re going past cultivated fields and prefab homes. It looks like there’s a lot more of the same up ahead. I turn around and choose a new destination — Subway! All of a sudden I’m hungry. There’s a Subway at a gas station near I-10 in Tonopah. I eat half of my foot-long, Italian B.L.T. in the PTV with the crew. The other half I save for later. 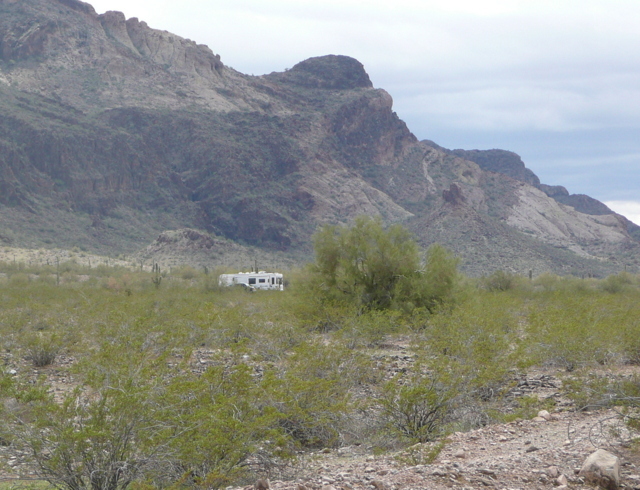 On the way back to camp I spy a lone camper on another of the BLM roads near Saddle Mountain. There are a few roads that I’d like to explore with the PTV, but I decide not to try them so soon after a heavy rain. I drive up our lane and see we have neighbors! “Are you Bob?” I ask as I step out of the BLT. Sure enough, he’s Bob of cheaprvliving.com. Our paths almost crossed once before when we were in California. We both looked forward to meeting each other as we’re fellow boondockers and fellow bloggers. Bob’s a quiet, steady sort of guy whom I can tell is a natural teacher, mentor, and encourager of others. The man with him is Jeff from New Jersey. Jeff camps in a camper van and is a comparative youngster in his forties with a great enthusiasm for the camping he can do during sojourns from his work back East. We relax in my camp chairs on the outdoor rug and set about getting acquainted with no shortage of topics to discuss. Bridget and Spike make friends with Bob’s dog, Homer. Bridget is fascinated by this big, handsome guy (Homer, not Bob or Jeff, although one could describe either with that term!). I’m too involved enjoying the company of my guests to take photos! We realize the shadows are long and the sun will set soon. “If we’re going for that walk, we’d better get going,” Bob says. 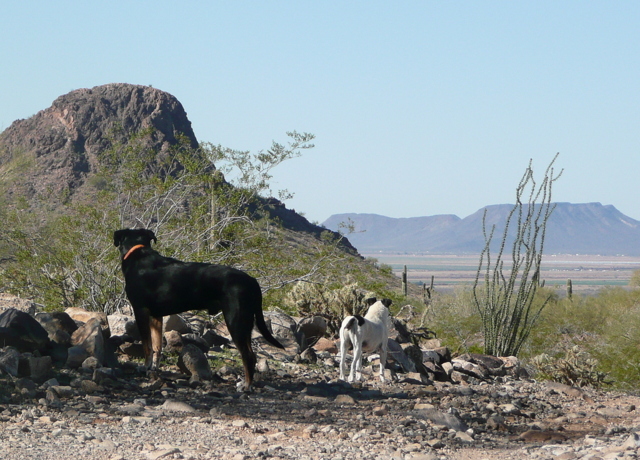 The six of us — three people and three canines — take off on a walk to the mountain. We find the canyon trail markers. That’s a hike for another time, earlier in the day. The sun sets behind a hill as we walk back to our campsites. A very enjoyable visit with two fellow nature-lovers! Again Bob, Jeff, and I set out on a hike with Spike, Bridget, and Homer. This time we walk all the way to the saddle between two hills, the same saddle the crew and I attempted to reach on a previous day. Good conversation on a beautiful morning with perfect temperature. Spike particularly enjoys having a guy-pal along. At the saddle, the crew and I turn toward home, while Bob and Jeff continue on. Later I’m again at my laptop starting this blog entry when a pick-up stops outside my window. A greeting of “Hello, Sue!” tells me this gentleman knows my blog. His name is Barry and his sister Barbara is a regular reader, sharing much of what she reads on my blog with Barry. We talk a long time. Barry is a great conversationalist with a warm personality. 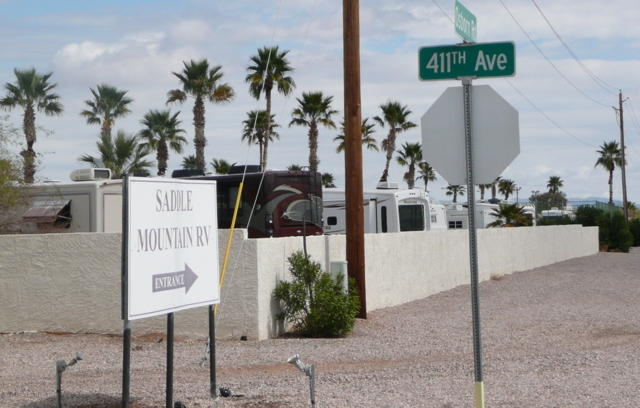 He’s camped in his fifth wheel at Saddle Mountain RV Park in Tonopah. This is his go-to camp during the winter. He’s familiar with Saddle Mountain and the surrounding area as he’s come here six times for extended stays. Barry shows me the weather app on his phone. “It’s going to get up to 93 later next week,” and so he plans to leave soon for cooler weather in New Mexico. I’ve started reading Steinbeck’s Travels with Charley, which Jeff gave me earlier today. I gave him Bannack, Skye’s West by Richard S. Wheeler in return. 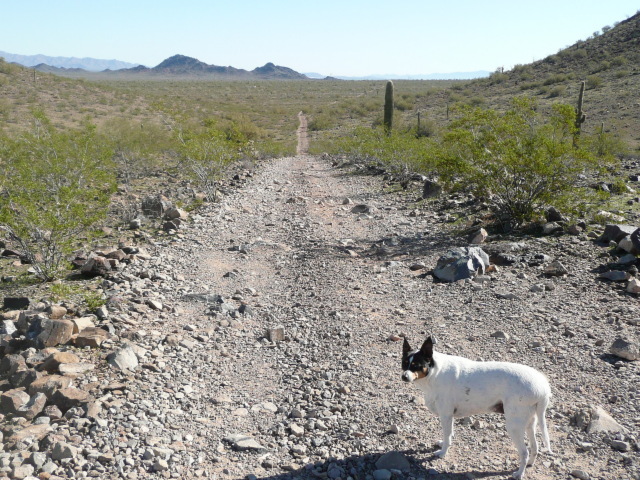 This entry was posted in Simple living and tagged desert, frugal, hiking, rat terriers, RVing, Saddle Mountain, simple living, Southwest, subway, Tonopah. Bookmark the permalink. 74 Responses to RVSue meets Bob Wells of cheaprvliving.com! So nice to meet fellow travellers out on the road exploring what’s up around the next curve or over the next hill! Thanks for introducing us to your new friends! You’re welcome, Geri. I’m busy entertaining menfolk! Like I said in a previous blog entry, if you want company hang your undies on the line! Now I can say, if you want more company, get nekkid at your campsite! Warmer weather is on its way. It may get too hot for us here. I think it’s a pretty good bet there will be another late snow. Enjoy the great weather you’ll have next week! Hi Sue, Looks like you had your fill of company to last a while, It’s nice every now and than..
I’m going to get caught by the weather no matter what I do. If I stay here I’ll get hot weather. If I move further north I’ll get great weather followed by a spring snowstorm like we went through last year at Ash Fork. It’s a chess game! I am following up on your questions on the Thermos Nissan Cook and Carry from Sue’s Feb 28 Post (Bridget? A trail dog? Who knew?). The thermal cookers being sold now work just as well as my 5 year old one! I tested it on one of my favorite recipes today – an Italian Sausage Soup – Tuscan Zuppa. The product cardboard box the latest cooker came in is 11.6 cube and the cooker itself is 10 inches deep x 10.5 wide x 9.75 High. For years I have been writing camping recipes. Your questions have inspired me to get a blog going – THANK YOU! I created the blog and wrote my first post today with a recipe that can be cooked in the Cook and Carry, crockpot or on stovetop. I have included some other details as well on the thermal cooker and links to other websites. Katy! What a wonderful idea for a blog! I’m sure many of my readers will want to check your blog often (follow it!) for the latest recipe you post. Click here to go to Katy’s new blog called Camp Test Kitchen. I appreciate the feedback on the thermal cooker on the Shopping Links page. I’m glad it works for you! Wow! I like that thermal cooker. Can you cook dry beans in it?? I would guese if you boil them then yes. Have you done that Katy? Yes, dry beans are a great use of the cooker and I use it often for that purpose. I will post a recipe in a few days on the website along with my experimental observations on bean doneness versus time with temperature notations. This is great! I’ve actually been looking for easy RV cooking recipes online for our multi-leg, and multi month trips and found zip. 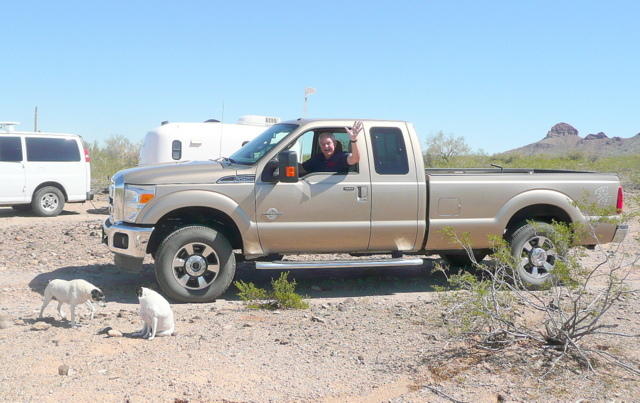 Looking forward to visiting your blog, in addition to Sue’ s, for RV lifestyle ideas. Your blog is a hit (keep up the good writing)! It’s kind of nice to put a name to a face. Sounds like you had a great day. I’ve visited Bob’s site before and it’s quite informative. Bob’s site is incredible. . . so much good information. And he has a Chevy Express van, too! Hi Sue, How fun getting to meet Bob . I Love his blog !! Do you have any summer plans? as to where you might go? I’m notorious for changing plans. I do want to visit Wyoming and Montana again, maybe get up to Glacier NP. But then, the Columbia River and Washington State is calling me, too! Wyoming and Montana are first on my summer list when I get an RV. I have only been briefly threw both states and want to explore them. It will be fun to see if you go there. It might be another year before I hit the road. I meant thru thos states. I did spend most of a summer in Colorado when I had an rv and Loved it. Have you explored that state Sue ? No, Colorado is on my to-see list. Hi Sue, just read you heard the Columbia River and Washington State calling your name. Taking I-84 at Umatilla, Oregon and following the Columbia is beautiful and so is Crossing the river to the Washington side is a beautiful driver also. Well, I tried my thermapot to cook some dried kidney beans and an onion. I knew I was going to be at work for 10 hours. This is what I did. I soaked the beans overnight. The next morning, I heated up some boiling water and poured it into the thermo cooker. (no food in it yet) This was just to preheat it, like you would a thermos. Meanwhile, I brought the beans/onion up to boiling in a different pan (remember the thermocooker has boiling water in it preheating) After the beans boiled for about 15 minutes, I emptied the thermocooker of the preheating water and poured in the beans, onion, and water they boiled in. I closed the lid, wrapped towels around the whole cooker and stuck it in a cardboard box. (Remember, I would be at work for 10 hours). When I got home that evening, I opened the cooker an took out the inner pot of beans. Although, I could place my hand on the side of the inner pot, it was hot enough that I couldn’t keep my hand on the side of the pot. It was still that warm after 10 hours. If I would have been camping and could have reheated the food after 3-4 hours, I have no doubt, you could safely cook a meat dish safely. I am impressed. Good information, Angie. Thanks for sharing. Steinbeck traveled in a truck with a chocolate brown standard poodle in the ’60s. I was in the same situation in the ’80s with a similar brown standard in a truck camper. Unfortunately, I am not a talented writer. Ah, Lefty… You wrote some wonderful memories in your mind that you can read any time you want. I’m impressed with how many people you meet out in the middle of nowhere…I live in a big city and never meet anyone. lol. It’s the RV state of mind, Ginger. That plus retirement. People relax, become their real selves, and regain their sanity so they can interact with civility and kindness. That’s my theory and I’m stickin’ to it! I met Bob this year, too. He is a true gentle man. I love how willing he is to share his knowledge of boondocking. Much like you do. Thanks to both of you. You’re welcome, Linda. You were fortunate to meet Bob, as am I. Sue, I saw you yesterday ! I just found your blog a few days ago. I had a trip to El Dorado hot springs planned and decided to venture out and explore the BLM land because of you ! Have you had a soak at El Dorado yet ? Hi,Julie! I did notice some cars out here. So one of them was you! Hot springs don’t appeal to me. I haven’t gone. Spike is the soaker in the family. yum a subway BMT (my fav) and now a camp recipe blogger…good thing it’s warming up around here, I can tell following all these great blogs that I am going to need to do more hiking to counter weight gain. How cool you got to meet up with Bob. I so love that there are bloggers out there fulltiming, all in their own unique way, and sharing through their blogs. I hope you know how informative and entertaining it is for all of us gonnabe’s. Hiking in new places is great exercise. It adds to the enjoyment to be able to walk long distances again with Bridget and Spike. We’ve had to be cautious for several months since her leg injury, gradually increasing the distance. Now she’s up to where she was before The Chipmunk Incident at Ice Cap Campground. I like you term… gonnabe’s… Good to hear from you, Kris. Travels with Charlie is a great book. I would have thought you’d already read it. Enjoy!! BTW: does anyone have plans for the camp kitchen in a box like we used to use when camping with the Scouts? I want something I as a 70+ Granny can lift. Those chuckboxes were made of wood which was pretty heavy by itself not to mention stocked with all the gear inside. Amazon.com has several “camp kitchens” that sets up to hold your gear. Keep doing online searches for “How to make a camp kitchen in a box?” and you might find what you’re looking for. Just wanted to say thanks for mentioning author Richard S. Wheeler…just finishing up Sun River, thoroughly enjoy his style, will be reading Eclipse next. Sun River was a good one. I just finished Dark Passage and also The Canyon of Bones. I’m almost done with the Skye’s West series… wish they’d go on forever! Yes, I’ve lived in FL (Clearwater) and GA and they are nothing like AZ. I enjoyed meeting Barry, and I appreciate you sticking with my blog from the beginning. Hi Dixie! I’m glad I finally met Bob. I admire the way he is willing to help people who want to try vagabonding. His website is a treasure trove of information. What a beautiful community you have built for yourself, all in the middle of nowhere, where the population is, oh…. 5 people per square mile? Just love it!! One day…. I’ll be on the road. For now, I live vicariously through you. Both Bob and Jeff are easy to be around and they, of course, appreciate the desert, too. Get neked and get company. What an interesting combination. I love meeting fellow bloggers, like old/new friends. Have met two more while in South Africa. Get nekkid and get company, but not both at the same time! I remember reading Travels with Charlie when I was in my 20s and wanting to travel around like he did but I was a girl and back then it was unthinkable. I’m so glad times have changed. I am now motivated to look on Amazon (through your site) and see if I can get the book on my Kindle for a re-read. Hi, DJ . . . I’m glad times have changed, too. I appreciate you ordering through my link. I’m enjoying the book. Hi Barry! I was nice to meet you, too. Thank you for following along with me and the crew and for using my Amazon links. You do photograph well . . . . Safe travels to NM. Wow lots of company! And good information too, as usual. Glad you got a couple of nice hikes in…bet the dogs enjoyed it too. Yeah, all three of us are enjoying hikes again. A good hike makes me feel more alive… and I think the crew feel the same energy. Sue, it’s official. I am the proud owner of an ear licker and one that likes it. I am now officially a member of your club. Melvin and Alfie, my pug/shih tzus, are the best brothers, and the best of buddies. Congratulations, DeAnne! Now you have your own canine crew to delight you, make you laugh, keep you warm and loved . . .
My cousin met a young lady from Brazil and introduce to the family. Anna was in her early 20’s traveling with nothing but a back pack. She is also a writer (I have to get her full name from my sister). Anyway, she spent a summer with my Aunt on the Navajo Reservation and loved it. Anna then travel to Sitka, Alaska to explore and worked in a gift shop while her Navajo friend she met in Window Rock worked on fishing boats. Needless to say they traveled all over the US back packing. Tioga George blogged about a young lady from Holland who also traveled back packing in Mexico. I guess this is true boon docking….sleeping on the road. Sandra, from Holland wanted to sleep under Ms. Tioga to keep the dew off her. Wow, I’m amazed at these world travelers on foot which is a tad different than RVing. Yes, these women are quite remarkable. However, living with nothing but a backpack is, IMHO, a reckless way to live. You have to be willing to suffer the consequences of roaming around in the elements without much between yourself and catastrophe. It’s a romantic notion to travel unencumbered, but lying on the hard ground when the temperature dips and the dew or frost settles on you in the morning is not idyllic. If they are living the way I gather from your comment, I would go so far as to say these women are extremely lucky to have not been traumatized or injured by the dangers that do exist. As usual, you are a little ray of humor, information, and the break I look forward to at the end of a hectic day. Thank you for sharing your days!! You’re welcome, Janet. I wish I could get myself writing every single days. Some days I don’t have it in me. After a break I’m ready to go again. I appreciate your kind feedback. I drove by Tonopah on I-10 Sunday afternoon sometime. On our way from SoCal to Tucson. Been out there about a week. Not camping…..our Alaska kids flew down for a Spring Break & wanted to see the beach & Disneyland. We did the beach part, but not the Disney. First time to see them in over a year. Our daughter & her son were able to go as well. Hadn’t read any blogs for over a week. Didn’t know you had moved. Wouldn’t have stopped anyway. Too many miles to cover, all were tired. I’ll have to catch up in my reading now we are back in New Mexico. 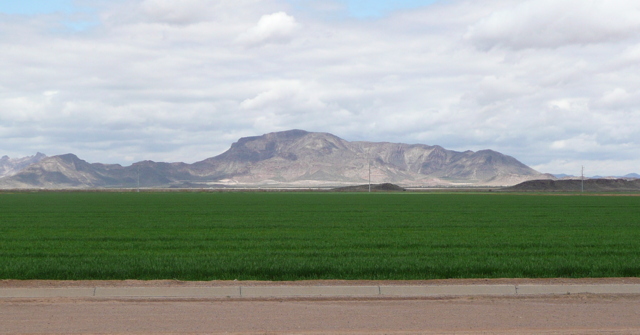 I remember passing Tonopah & Saddle Mountain; wife, daughter & grandson were sleeping. How wonderful for you and your family to have that time together. I know what you mean about not stopping when there are miles to cover. Now you’re back in blogdom again! Great to hear from you again. Sue, I am constantly seeing the “someday I’ll be traveling too” posts here. As a old man who spent every opportunity when younger camping and seeing America’s wonder I can now only wish I was still able to do that. Up until I was 65 or so I really got around. Now, due to medical situations for both the wife and I we can’t venture out as we once did. I advise anyone who is making “someday” plans to travel and camp to DO IT NOW!! Do it while you can because one never knows what the future holds for you. I now travel with Sue via her wonderful blog. I agree with you, Jim. It makes me sad when I read about a person who wants to full-time now and the spouse keeps delaying it or won’t even consider it. Of course, there are situations where a delay is necessary. I waited 8 years so I could full-time with a pension and with the PTV and BLT paid for which were key to success. I did have a set date though, not a vague “someday” that very often doesn’t ever arrive. Note to AZ Jim and spouse. My advice is the same as yours. I’ll soon be 73 and have limited my RVing to state parks nearby. someday I won’t be able to handle that either. So glad I went when I could. Now I have memories instead of regrets. GO WHILE YOU CAN – you never know if it’s the last. 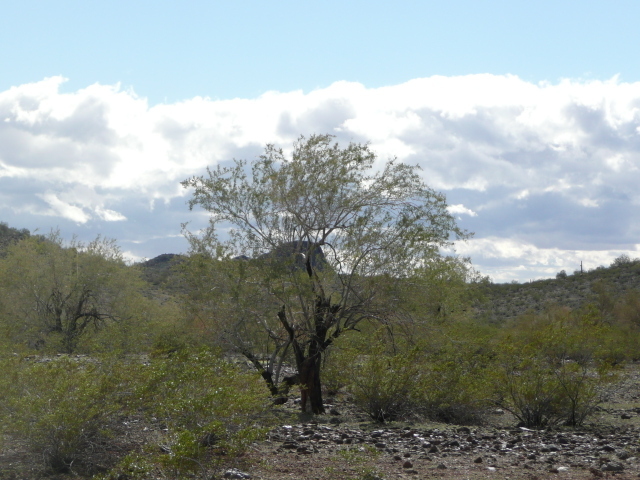 Yes, I was wandering around on Saturday in my teal Honda Odyssey and got out to hunt for desert roses. I’m only a weekend camper but love the idea of full timing someday once my kids are raised. For now I pull a little 13′ Scamp that I left out at my campsite before I headed out your way. Gee, did you find any desert roses? You’re welcome, Terry. I’m sorry about the email address. Maybe my writing was poor. I know that email address works. I’ll email you so you’ll be sure to have the correct address. It might not be right away. I’m having trouble with dropped connections right now which is why it’s taking me so long to reply to comments and why I didn’t post yesterday.